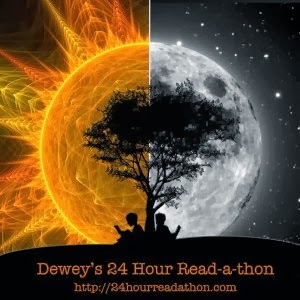 If you haven’t done so already, you can sign up for Dewey’s 24 Hour Read-a-thon here. So far there are 296 participants eager to read for 24 hours. Personally? I have never lasted the full 24 hours. Invariably, something comes up which prevents non-interrupted reading time, and I doubt I could read that many hours straight without seeing stars. Or, falling asleep. So, you may have to make the “24 hour” thing custom fit your needs. But, I do manage to read considerably more than I usually do on a given weekend, and let’s face it, that would be a lot of time devoted to reading. Not cleaning. Not cooking. Not laundering. No, as much time as possibly on Saturday will be spent on simply reading. I’m looking forward to several books. For one thing, I have Wally Lamb’s latest book, We Are Water which I’ve promised to review November 14. Also, Arti of Ripple Effects and I are reading Proust’s Within a Budding Grove this fall with a final post at the end of November so surely I should begin it this weekend. Those are the two main things I’ll concentrate on reading. Yet, it’s always nice to break up some heavy books with some children’s literature. Or, I might try some poetry as Parrish Lantern relishes. I could even open up a book of Japanese short stories for my own Japanese Literature Challenge which has lain all but forgotten since school began in August. So, the best laid plans…are you signed up to read? Do you have big stacks lying in wait for the big day? I’m ready to cheer you on! I can never get through the 24 hours, but I love watching everyone's posts! I have a couple of classics loaded on my Kindle, but I'll have to see what the weekend brings — I can't wait to see what you think of Within a Budding Grove! It is a lot of fun to see what everyone else is doing for the read-a-thon. Can't imagine what possessed me to become a head cheerleader (?!) but I'm sure I'll get around to a lot of blogs in that capacity. The posts are intriguing and inspiring. Have you read Within a Budding Grove? After Swann's Way, one of my favorite reads of the year, I'm eager to try Volume 2. Crack me up…at least you have the ability to define your boundaries! I have not yet participated in an official, “bloggy” read-a-thon. I'd really need to modify one to fit my schedule. The whole point is to just read more, I suppose. Have fun cheering on the participants! I think 12 pages a day sounds so manageable! I should try that pace, or even twenty pages as I'm behind you. So looking forward to this event! I haven't done a readathon in a while, so it should be fun. I think I can be so brave because I know my time is limited. Never, ever, once have I been able to read on a Read-a-thon weekend conflict free. Lest I go on for pages, I'll grab the time I can and be happy with that. I'm so happy to be reading along with you! I hope you're on my team to cheerlead for! I hadn't planned to participate, but if you're cheering, I may change my mind! 🙂 We have a full schedule on Sunday, so maybe between loads of laundry, I can curl up with a stack of books (or just one) and read all day on Saturday. It's been a while since I've joined in on this event. I want to say that the last time was when Trish did some sort of cheering video. I think that was when I first “met” her. Anyhow, good times to come. Happy reading! I love this readathon 😀 I can't wait! I haven't made it the full 24 hours yet but I've been darn close. Maybe this time around I'll make it? I've participated a few times in the Read-a-thon and have never lasted the 24 hours either. It's so much fun though. I'm not participating officially but I will try to do a bit more reading. Have fun being a cheerleader! If you can't do it, Jennifer, no one can. I'm counting on you!